This fun chart can be the foundation for students in each grade level. The anchor standard explicitly states that students should analyze how and why individuals, events, and ideas develop and interact over the course of a text. At first glance this seems simple. The problem is that, after reading a text, many students struggle to even define or classify the individuals, events, or ideas in a text. When I work in classrooms, I find that this inability to even identify these different categories of information prevents students from moving to the more complex task of examining the relationships and interactions between them. Your students need to be able to explore what an idea is before they can analyze how it is introduced or interacts with other elements. Once you have spent time discussing the distinctions, use the large sticky notes at the bottom to begin working on analysis of how these components interact. I suggest that all teachers start with this anchor chart. When you prepare the title of this chart, the word connection should be replaced with the words relationship or interaction to align with the exact language of your standard, depending on your grade level. The large sticky notes at the bottom should include the type of interactions that your grade level standard demands. Switch these out as needed. Third grade teachers should replace ideas, events, and individuals with historical events, scientific ideas and steps. In the third grade class, the questions on the sticky notes should ask students about time sequence and cause and effect. Fourth grade teachers should replace ideas, events, and individuals with procedures, concepts/ ideas, and events. 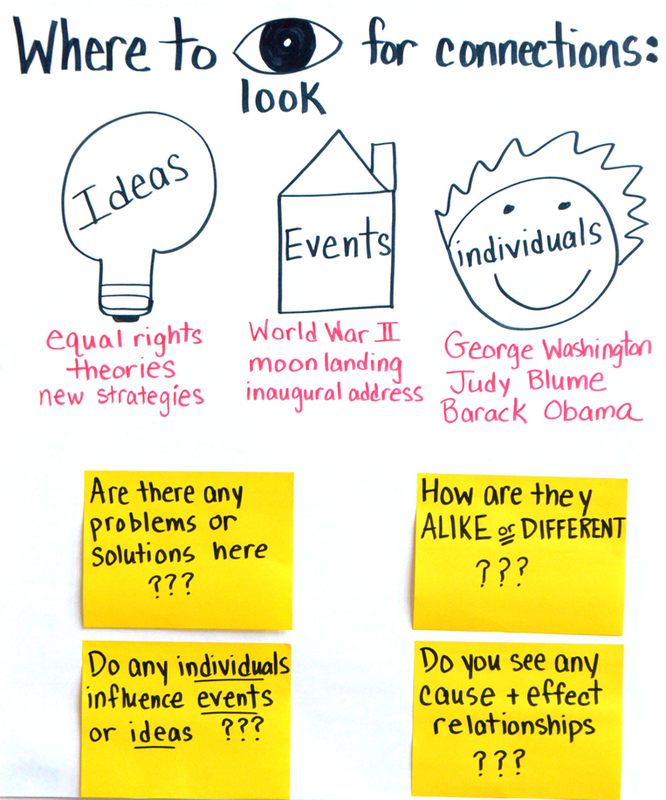 In the fourth grade class, the questions on the sticky notes should ask students what happened and why. Sixth grade teachers should ask a question on the sticky note about how these were introduced, elaborated on, or illustrated. The focus is on how the ideas, events, and people were presented and described to the reader. Wow, this chart is nice! My third graders will love this. Simple and to the point.